Shop X-Act Contour Premium , WeatherBeater , KickBack Mud Flaps , Mud Guards , Wheel Well Guards , GearBox Underseat Storage , Quad Caps Bed Rail Protector , and back to Husky Liners or Shop By Brand. WeatherBeater™ premium liner material is sporty and rugged. Imagine having a durable and slip-proof premium liner for your vehicle’s cargo hold or floor area. With a Husky Liners® WeatherBeater™ Liner, you can enjoy a durable liner that offers outstanding protection from mess and scratches. With the Husky FormFit Design™, you get a perfect liner fit for your vehicle that provides both a customized design and sleek look to your vehicle. These innovative liners feature a FormFit Edge™ that runs along the door jam to help protect your vehicle from spills and damage. The materials StayPut Cleats™ also ensure that the liner doesn’t shift when you’re driving. Made from elastomeric materials, these rubberized non-slip surfaces stand up against harmful chemicals and the toughest spills or mess. 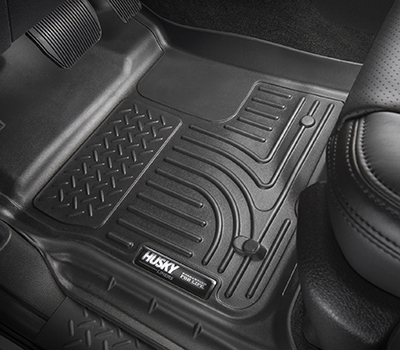 When you install Husky liners, you won’t have to worry about damaging your vehicle’s carpet anymore. The WeatherBeater™ Liner offers a superior barrier that prevents stains and damage to your hard-to- clean carpet. Plus, it’s easy to fit the liners inside your vehicle - just place the contoured material in the space, and you’re set! At Auto EQ we offer Husky Liners® WeatherBeater™ Cargo Liner and WeatherBeater™ Floor Liners for a variety of different vehicles, including Nissan Sentra, Volvo XC 90, Lincoln Continental, Lexus GX, and Ford F-Series. Oder today and take advantage of our fast, free shipping across Canada!